When it is time to consider better frugal living tips to make the most of one income, this list is pretty extensive. There are a few things on here that are new, mostly old classic ideas, but also some things that might totally surprise you. 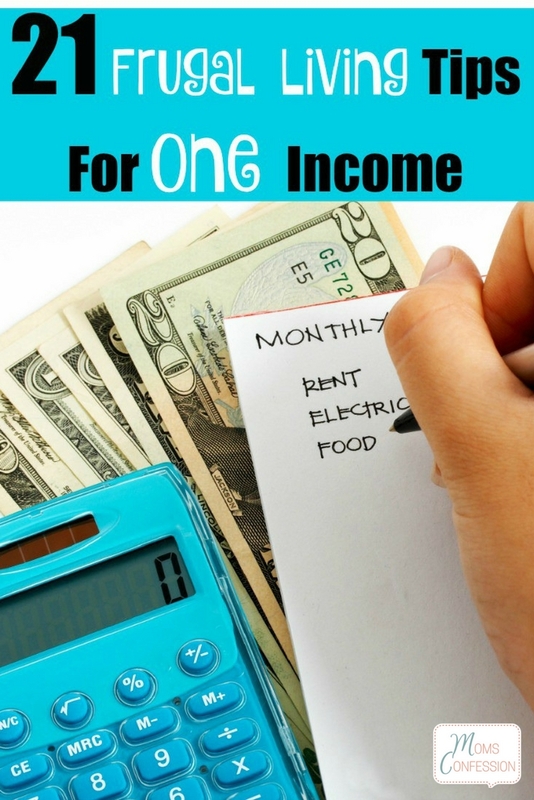 Living a frugal lifestyle isn’t easy for everyone, but if a one income household is your current situation, it may be the only option you have. Whether you are working to have a stay at home parent option, or someone has lost a source of income, these ideas are going to make it much easier for your family to manage. Use coupons for everything possible. This is an obvious option, but it is worth repeating. Coupons are great for groceries, health and beauty needs and even things like your clothing purchases. Check with local restaurants, chain stores and even your mechanic for a coupon available to save you money on all the necessary purchases you make. We have a great post on how to save money with coupons to get you started. Never pay full price. If you can’t find it on sale, discounted or available in a cheaper generic option, don’t buy it. Do your own DIY repairs. From car repairs to household repairs, doing as much yourself is the best financial practice. One of the best frugal living tips you will find is to learn how to do things yourself so you aren’t paying so much in service charges or for repairmen. Menu plan consistently. One of the biggest drains on your budget is your grocery expense. 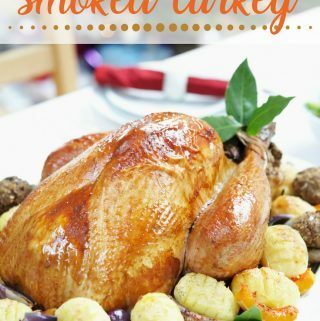 Menu plans can make it much easier to save money and feed your family. We have great menu planning resources to make it easier. Take on part-time work at home jobs to fund vacations and splurges. The idea is to live off one income, but sometimes that means you just don’t have extra for those little splurges that everyone deserves on occasion. Taking on a work at home job like blogging, being a virtual assistant or even doing surveys can help supplement income without sacrificing time with family. Get realistic about wants versus needs. For most families, this means cutting out things like unlimited phone plans, satellite or cable television or even eating out. Focus on the basics and allow those wants in your budget only when there are flexible funds allowing you to. Shop second-hand stores. Second hand, thrift shops, yard sales, consignment stores and more are great places to find everything from homeschool curriculum and kids clothes to used appliances. Downsize as much as possible. Some families can sell a car since only one person is going to and from work each day. Others may be able to move to a smaller home or apartment. It may even be downsizing your obligations or routine so you aren’t spending so much on gas to travel back and forth. Make your own when possible. This applies to tons of things in your home. Sewing your own clothing, making your own laundry detergent and even making your own meal mixes. We even have a list of 5 Homemade Cleaners that are wonderful and frugal! Evaluate basic needs for better options. Things like health insurance, homeowners insurance, phone service, Internet service and similar are basic needs for most families. Sometimes, however, you may be paying more than you have to pay. Take the time to evaluate and see if you can pay less for the same quality. Go back to old school entertainment choices. Instead of dinner and a movie out, play board games, cook meals together or even just go for a walk. We love Monopoly and Uno for hours of fun! Invest in efficient energy sources for long-term savings. One of the best frugal living tips is that sometimes you have to spend money to save money. Solar panels, energy efficient appliances or even better windows and insulation in your home are good investments that pay off in the long run. Recycle as much as you can. This goes for basic things like paper, plastic, and aluminum, but also food leftovers, scraps for compost and various scrap wood pieces for projects and crafts. Stop comparing your situation to other families. This is hands down what I believe to be one of the best frugal living tips you can follow. Comparisons only make you dissatisfied with your life and want more. Set realistic goals for your family. Some things just aren’t functional for every family. If you have a child with a lot of doctors appointments, having only one car may not work. Consider your actual family when setting goals. What works for one, does not work for others. Rethink adding to your family. Many families want to have more children. 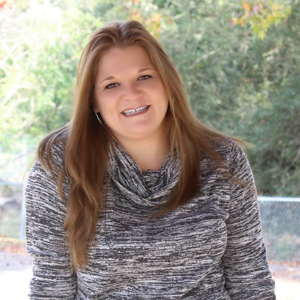 Kids are a wonderful blessing, but there comes a point sometimes when finances are tight that adding to your family just isn’t right at that time. If you are struggling on one income, reconsider your plans to add to your family. Don’t sacrifice your health. This means you need to make sure your health insurance is paid and doctors visits are made as necessary. When a parent gets sick, it brings the whole family down, physically and financially. Preventative care also includes eating healthy and exercising regularly. Don’t sacrifice your savings account. Savings is not an option. It is a necessity to provide a buffer for emergencies. Under no circumstances should your savings be halted because you are choosing to live on one income. Take budgeting and money management classes. Learning more about money management, how to pay down debt and how to build a savings account is vital to living frugally. Check out local banks, community colleges and even financial advisors for free classes. Use the Dave Ramsey envelope method. This method is highly popular because it makes you use just cash to pay for expenses. Once the cash is gone, you can’t do anything else. This means you can easily keep from getting into debt and stick inside your budget. Think like a prepper. This may sound odd, but those who are considered “preppers” live by some of the best frugal living tips ever. They are always in a mode of preparing for the future, whatever that may be. That means stocking up on non-perishable items when possible, keeping the pantry well-stocked and always considering future needs. This can work for everything from keeping a good savings account to building a pantry stockpile of foods. 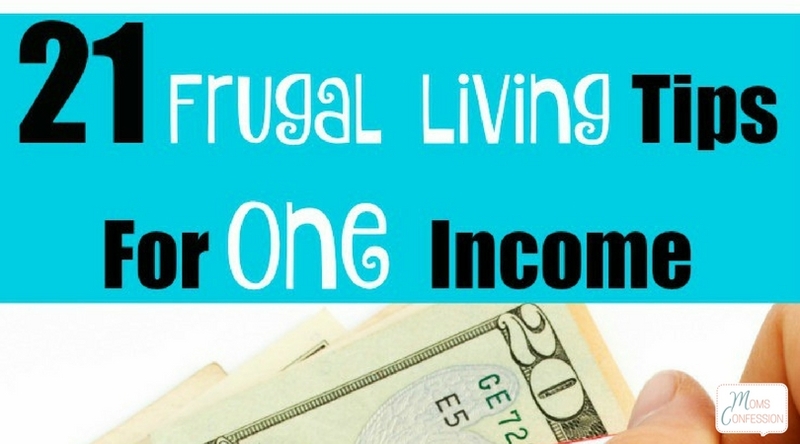 These frugal living tips are ideal for any family living on one income! They help you to focus your money in the best places to keep your family taken care of with ease. Hi Kristi. Love your site. The David Ramsey idea is great, but use play money to stuff the envelopes since keeping cash in your pocketbook or your house isn’t a wise idea with the potential of being robbed. Thanks for the tip Ann!